As paid search marketers, we look at a lot of data to help us improve performance for our accounts. While we might have developed our own tricks to extract insights from our channels, AdWords has a few great tools that aren’t as easy to find as they maybe should be. So read on for five easy to use breakdowns in AdWords that just might change how you see your paid search accounts. Often debated and often misunderstood, are sweeping generalizations about ad position and how it affects your account performance. The value of understanding this metric isn’t lost on our team, which is why using the Top vs. Others segment in AdWords is important. This report displays the performance of your keywords, ads, campaigns or ad groups when they are in the top bar or sidebar. Doing so helps you understand the benefit of positioning for all of these factors so you avoid generalizations and can act specifically. 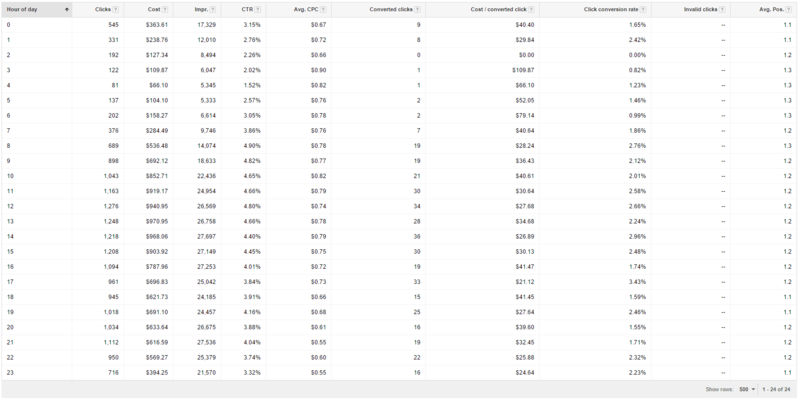 AdWords does not present sitelink data in the most accessible way for ascertaining performance. Much of the data is an aggregate of how the entire ad performed when the sitelink was visible, not how the individual sitelink did. It has always been a personal pet peeve of mine that conversion data for sitelinks is just a total of all conversions that occurred when the sitelink was present, not when the link itself was clicked. You can use this segment to answer questions like, are consumers clicking on my sitelink in droves but never converting? Knowing when your ads are performing best and when they’re not is helpful for a long list of reasons. Seeing this data could highlight account performance issues, as well as user activity trends. Doing an audit? Trying to understand quickly what’s next for you to work on in that massive account of yours? Never underestimate detailed overview reports. The Campaign and Ad Group Detail view in the Dimensions tab of AdWords provides counts for important actions taken in your account such as the number of ads active, disapproved and sitelinks active on an ad group basis. Google cares deeply about mobile traffic and so should you. As second screens become increasingly relevant to paid search each year, understanding your performance on different devices is crucial for keeping up.